This is my first 13,56MHz RFID Reader Setup: Arduino, SM130 with PCB Antenna. Parts of the Wiring are covered by the RFID module, but they get understood when you have a look on the according scheme. //Simple communication sketch for the SM130 RFID-reader. //The sketch reads a tag end sends it over the Serial port. 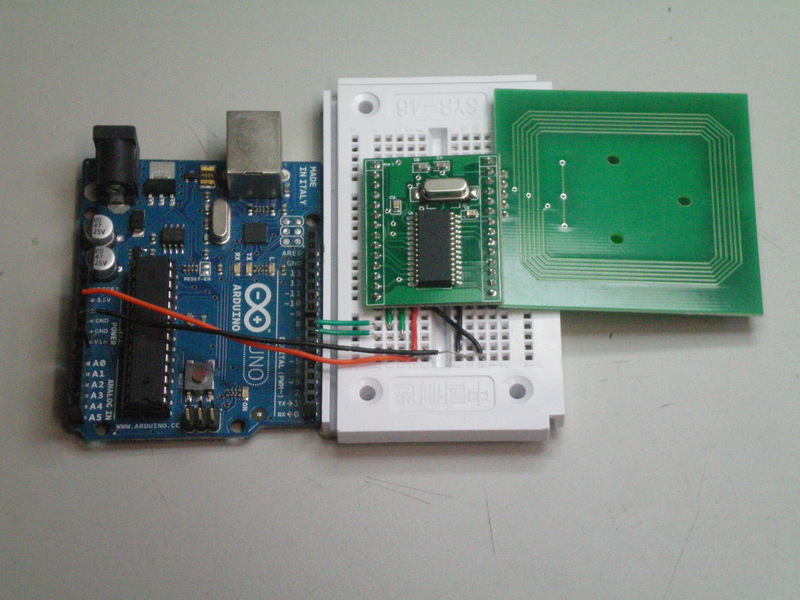 The code by Ben Lamb could be compiled, but I could not get any RFID tag ID be printed in the arduino serial monitor. Haven’t spend more time, to get that version running. I found some more example code by Marc Boon, which I have not tested yet. Always be patient with the example code. Once in a while there some issues on the Arduino library SoftwareSerial, which changed to the NewSoftSerial. Final date of the DA hand over!